We are fully insured, use OSHA-trained technicians and are available 24/7 for your cleaning needs. Apex is committed to providing our clients with superior, dependable service at a reasonable price. We use the most technologically-advanced equipment and experienced technicians. We provide value-added services to our clients with an emphasis on customer service, reliability and attention-to-detail. We take time to understand your project and we pride ourselves in coming-up with the most efficient and cost-effective method to complete it. At Apex, safety is our number one priority. 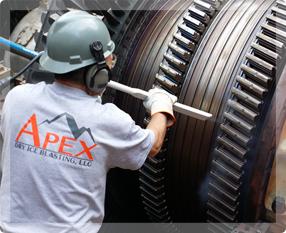 To get a free estimate for your equipment cleaning, warehouse cleaning, or general industrial cleaning needs, contact Apex Dry Ice Blasting today at (330) 673-9549. Our technicians serve all of Ohio and Western Pennsylvania with reliable cleaning services that will significantly reduce your facility’s downtime!